For several decades it has been orchestrated that there was an Aryan Invasion of India which destroyed the Harappan Civilization. However, as shown in this book (pp. 10 ff. ), there is no evidence whatsoever of any invasion or of the presence of an alien culture at any of the hundreds of Harappan sites. 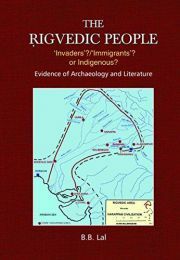 While one is glad to note that the Invasion theory is dead, it is a pity that it is being resurrected in a new avatar, namely that of Immigration, of people from the Bactria-Margiana Archaeological Complex of Central Asia, who, the proponents think, were nomadic Aryans. This book advances cogent arguments to demonstrate that this new theory is totally wrong (pp. 19 ff.). For all this mess, the dating of the Rigveda to 1,200 BCE by Max Muller is squarely responsible. The combined evidence of hydrology, archaeology and C-14 method of dating shows that the Rigveda is assignable to the 3rd-4th millennium BCE (pp. 118 ff.). The Rigveda (X. 75. 5-6) also tells us that the Vedic people occupied the entire territory from the Indus on the west to the upper reaches of the Ganga-Yamuna on the east. Archaeologically, during the aforesaid period and within the above-noted territory, there existed one civilization, named the Harappan. Hence, the Harappan Civilization and the Vedas are nothing but two faces of the same coin (pp. 122-23). Further, the evidence from Kunal and Bhirrana (pp. 54-55) establishes that the roots of this civilization go back to the 6th-5th millennia BCE, indicating thereby that the Harappans were the sons of the soil and not aliens. Thus, the Vedic people, the Harappans, were indigenous and neither Invaders nor Immigrants .